So Web Directions South finished on Friday and it’s taken me this long to compile my thoughts and even begin to write some stuff down about the conference. 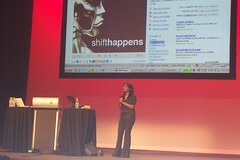 I took my laptop to Sydney and didn’t get it out of the case once – the plan had been to blog as I went. The last thing I wanted to do was use it in the hotel room because I was tired every time I was there, and I didn’t use it at the conference because I was either at a session, eating, getting some fresh air or talking to others. Many people did take advantage of their laptop though as is evidenced by many of the available photos. I went to Sydney by myself and knew that I wouldn’t know anyone at the conference so thought I’d try to hookup with people who would be attending. Due to the power of the internet I found out there was going to be a Port80 meetup on the Wednesday night prior to the conference so I went along. They were very welcoming and everyone had a good night. We were there on trivia night so most of us played and the table I was on came second overall. We won some vouchers, and a six-pack of beer. I don’t know who ended up with that but as the drinks were free I didn’t care that I didn’t get a share. I was also getting over the after effects of a sore tummy from a bug I had earlier in the week. I’m glad I hooked up with some people at this meetup because I didn’t meet many people at the conference itself. I’m not a natural networker and find these things quite hard. The conference organisers had the Mikons idea but apart from talking to a couple of people about them I didn’t find it a real conversation opener. I did earn myself a Mikons t-shirt, however, because I’d designed one that ended up on the t-shirt. I had arranged to meet with Leah McLean from Working Solo. We talked a couple of times over the two days and it was good to talk to someone who used to work in the corporate world and then left it to go out on their own. It takes guts to do that and I admire her for it. There seemed to be a good mix of people at the conference, a good mix of genders and ages. As for presenters, I think I went to just about every female presenters session, not by design, but just because I was interested in their talks. There were sessions I missed but all are supposed to be available as podcasts so I will catch up. I’ll talk about a couple of sessions I attended here and save the rest for another day. LinkedIn and Friendster were first generation social networks but have been superseded somewhat by Flickr and YouTube. Digg – people conform. If people Digg a story then others will usually follow. It encourages mobs. Facebook – viral navigation, ie applications getting passed around therefore making spammers out of all of us. Good content is key – eg Shift happens (I’d just seen this before I went to the conference). Sebastian Chan from the Powerhouse Museum talked about social media and government and how they opened its collection and research database – to public tagging, and dynamic user-driven recommendations. This got their audience more involved in their exhibits and collections and as a result they were able to learn a lot about their audience. I kept thinking during this presentation at what it must be like to have management that let them go ahead with this. They did start small and when it proved a success were able to continue and grow. Flickr was mentioned at just about every talk I went to. I think this makes it just about the most widely used website available. George Oates gave statistics on how many photos are uploaded each minute and each day and it’s phenomenal. 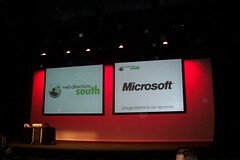 For the Web Directions photos alone, there are nearly 1500 as I type this. That’s more than two photos for every attendee there. I didn’t take any photos of me, but others did. Wow – I am tired from reading that – sounds like you were busy and took a lot in. I look forward to your informative posts that will develop from the experience. Thanks for making contact before the conference Jenny because apart from you I didn’t expect know anyone there either. I did happen to bump into a friend that I hadn’t seen in a long time – but that was just icing on the cake. Stepping out from corporate has been one of the best things that I have done. After 8 years on my own as a solopreneur I’m not planning on going back in a hurry (I doubt that I would even be employable anymore after this long out). I love public tagging, for every website but especially for museums. I completely agree that it can help a business or an organization learn about their members/audience/clients. Another great recap, thank you.